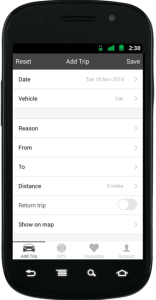 Tripcatcher, the add-on for capturing your mileage expenses and publishing them to Receipt Bank, now has a smartphone app. The new Tripcatcher app runs on both iOS and Android phones and lets you complete your mileage expenses with minimal effort whilst on the move. Download for Android or download for iPhone today. The app saves your trips to the Tripcatcher website, where you can publish them to Receipt Bank. Tripcatcher enables you to check you have completed all of your mileage expenses and see the value of your claims: including the value of the fuel invoice needed to reclaim VAT. When entering a new business trip, you can tick a box to save the trip as a Favourite. The next time you make the same trip, select the trip from the Favourites tab to complete the trip data. This means less keying and saves you time. If you don’t know the distance you travelled on your business journey, Tripcatcher will calculate it for you. On the Add Trip screen there are two input boxes, “From” and “To”. You can enter postcodes, street addresses, or towns, and Tripcatcher will calculate the distance between the two locations. Tripcatcher uses Google Maps to verify the start and end locations, and to calculate the distance. It's really easy to use GPS with Tripcatcher. At the start of your trip tap the “Start Tracking” button and Tripcatcher does the rest. Tripcatcher uses your phone’s GPS to track your business miles. Once you have reached your destination you simply tap the Stop Tracking button and your total journey distance is calculated. Tripcatcher takes distance calculations throughout your journey to ensure the full path travelled is used to calculate the distance, increasing accuracy. Once you have entered the reason for the trip (required by HMRC) you simply press the save button and the trip is saved to the Tripcatcher web app. N.B. Currently GPS only works in the foreground and will stop working when you receive calls – this will be fixed in the next release. The Tripcatcher phone app also allows mileage to be recorded for multiple Tripcatcher accounts: this is important if you have more than one company (the 10,000 miles allowance at 45p is applied per company rather than per individual). Keeping track of your business miles shouldn't be a chore and with Tripcatcher you'll never have to reach for a pen and paper again. If you are looking to claim for all your business mileage and publish to Receipt Bank then the new Tripcatcher phone app is for you!